This luscious cake falls in the center after removing from the oven, creating a space to fill with rich chocolate cream. It’s an elegant treat for Valentine’s Day or any special occasion. Preheat oven to 350° F. If making cupcakes, line cupcake or muffin pan with paper liners. If making a cake, spray a ten-inch springform pan with an oil-based, nonstick coating. 1. Mix 8 egg yolks, orange juice and melted chocolate. Keep warm. 3. Whip the 8 egg whites and sugar to a medium consistency. 4. Fold the two mixtures. 5. Fill each cupcake liner 2/3 full. 6. Bake 10 minutes or until fully risen and drying in the middle. Remove from oven. The cupcakes will fall slightly in the center, creating a space for the filling. Set aside to cool completely before filling. 1. Heat the cream and milk to boiling in a pot. 2. In a bowl, whip the 4 yolks very thickly. 3. Pour the cream and milk over the eggs and whisk. Return to the pot and lower heat. 4. Cook until thickened, constantly stirring with a rubber spatula. 5. Add chocolate, strain through a fine strainer. Refrigerate until cold, at least 8 hours. 6. Spread chocolate filling on each cupcake. 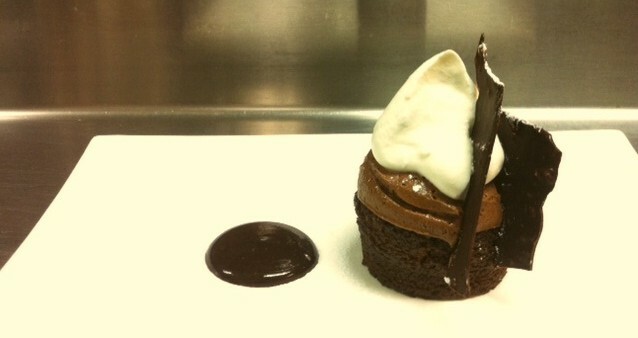 Top with a dollop of whipped cream and chocolate shavings, or dust with cocoa powder. Follow directions above but put cake batter in a springform pan and bake for 20 minutes. Cool the cake completely, then remove from the pan and set on a plate. Fill with frosting as indicated above. Baking time: 10 minutes (cupcakes), 20 minutes (cake). Chilling time: 8 hours. Nutrition Analysis: 400 cal, 27 g fat, 215 mg chol, 70 mg sodium, 31 g carbs, 3 g fiber, 24 g sugar, 8 g protein. Kathryn King, pastry chef for acclaimed Atlanta restaurant Aria, combines an eye for design with seasonal ingredients to create treats that make saving room for dessert a very pleasurable experience. After studying fine art and ceramics at the University of Georgia, she started working in restaurants with no culinary schooling, learning the ropes of the industry through her first-hand experience in the kitchen. She is a supporter of locally grown, seasonal ingredients and takes great pleasure in raising awareness about using local produce whenever possible.